Continental Army commander General George Washington’s first military campaign ended in disaster. In July 1776 British commander in chief Major General William Howe and 32,000 British troops (the largest expeditionary force in British history until the 20th century) landed in New York and proceeded to drive Washington’s troops from Long Island and Manhattan. 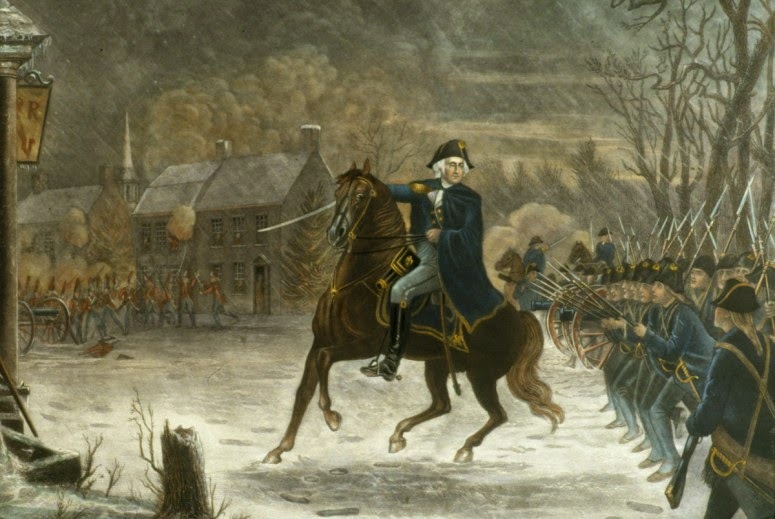 Washington suffered one defeat after another; often his men simply broke and ran. Washington then left an isolated garrison at Fort Washington on the Manhattan side of the Hudson River. In mid-November, supported by ships in the Hudson, British forces cut off the garrison and captured it along with 3,000 prisoners, 100 cannon, and a huge quantity of munitions. The same thing almost happened a few days later to the colonials at Fort Lee, across the Hudson in New Jersey. Washington fled to the interior. Howe pursued in dilatory fashion, ignoring the Hudson to go after the Continental Army. Washington got away, his army safely behind the Delaware River. On December 13, 1776, British forces caught up with Major General Charles Lee, who had rejected Washington’s orders to join him. The British captured him and some of his 4,000 men near Morristown, New Jersey. The British then went into winter quarters, their forces covered by a line of outposts. 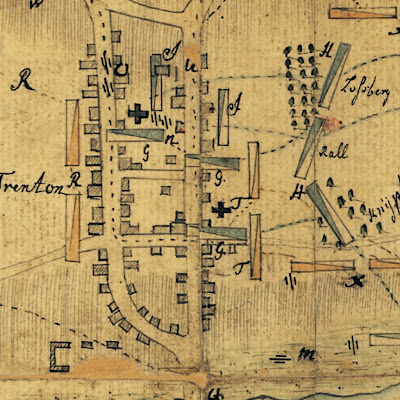 The most important was located at Trenton, New Jersey, and was held by Colonel Johann Rall’s Hessian mercenaries. What was left of Washington’s force was deployed across the Delaware River from Trenton. Washington’s position was critical. Smallpox ravaged his force, and half of his 10,000 men were sick. To make matters worse, enlistments for most would expire in a few days, at the end of the year. Washington decided to risk everything and mount a surprise attack on Trenton. Everything depended on getting the men across the icy Delaware at night to achieve surprise. Crossings by 5,500 men, horses, and artillery were to occur at three separate locations, with the forces converging on Trenton. If circumstances allowed, they could then advance on the British posts at Princeton and New Brunswick. The attempt was planned for Christmas night, December 25. The crossing was to start at 5:00 p.m., with the attack at Trenton scheduled for 5:00 a.m. the next morning, but weather conditions were terrible, and the troops were slow to reach their assembly areas. As a consequence, the men began loading an hour later than planned. Shallow-draft wooden Durham boats, 40–60 feet long by 8 feet wide, transported the men across the river. Perfect craft for such an operation, the Durham boats had a keel and a bow at each end. Four men, two to a side, used setting poles to push off the bottom and move the boats, which also had a mast and two sails. Horses and artillery went across the river in ferries. All did not go smoothly, as a storm swept through. Of the three crossings, only the major one at McKonkey’s Ferry under Washington with 2,400 men occurred in time for the planned attack. That force was divided into two corps under major generals John Sullivan and Nathanael Greene. Colonel Henry Knox commanded 18 pieces of artillery. Conditions were horrible. The men had to contend not only with the dark but also with wind, rain, sleet, snow, and chunks of ice in the Delaware. The password for the operation, “Liberty or Death,” reflected its desperate nature. Washington had planned for the crossing to be complete by midnight, but the last man was not across until after 3:00 a.m., and it was nearly 4:00 a.m. before the army formed and began to move. Washington’s men were poorly clad for such an operation; some actually had no shoes and wrapped their feet in rags. The men thus marched the nine miles to Trenton. Washington was determined that the attack would succeed. When Sullivan sent a message to him that the storm had wet the muskets, making them unfit for service, Washington replied, “Tell General Sullivan to use the bayonet. I am resolved to take Trenton.” Washington’s will, more than anything, kept the men going. On nearing Trenton, Washington split his force into the two corps to follow two different roads for a converging attack on the British outpost. The attack began at 8:00 a.m., with the two columns opening fire within 8 minutes of one another. The battle lasted some 90 minutes. The Hessian garrison consisted of three regiments, 50 Hessian Jägers, and 20 light dragoons—about 1,600 men in all—along with six 3-pounder guns. Continental Army forces soon drove the Hessians back. Artillery played a major role, and here Washington enjoyed a 6 to 1 advantage, with his guns deployed to fire down the streets of the town. The battle itself was a confused melee of men fighting in small groups or singly. Rall rallied his men, intending a bayonet charge down Queen Street, but was soon mortally wounded, and the Hessians were cut down by individual Americans with muskets and rifles and by artillery fire. The Hessians lost 22 troops killed and 92 wounded; 948 were captured. The remaining Hessians would have also been taken had the other columns gotten into position in time. The Continentals also secured a considerable quantity of arms and booty. The Americans lost only 2 men, both frozen to death, and 5 wounded. With little food or rest for 36 hours, Washington’s men needed relief, and he was thus forced to suspend operations. On December 27 the Continentals were back across the Delaware. Washington followed up Trenton by an attack against Princeton. Recrossing the Delaware on January 2, 1777, he routed 1,700 crack British troops at Princeton under Lieutenant Colonel Charles Mawhood. These two small Continental victories changed the entire campaign. Washington called Trenton “A glorious day for our country,” while British minister for the colonies Lord George Germain exclaimed, “All our hopes were blasted by the unhappy affair at Trenton.” Trenton helped end the Continentals’ fear of the Hessian troops. More importantly, the two battles of Trenton and Princeton added immensely to Washington’s prestige, which was at a low point a month before, establishing his reputation as a general and a leader of men. The battles also restored Continental morale, which had been at its lowest point since the start of the war. In two weeks Washington had snatched victory out of the jaws of death and fanned the dying embers of American independence into flame again. References: Fischer, David Hackett. Washington’s Crossing. New York: Oxford University Press, 2004. Ketchum, Richard M. The Winter Soldiers: The Battles for Trenton and Princeton. New York: Anchor Books, 1975. McPhillips, Martin. The Battle of Trenton. Parsippany, NJ: Silver Burdett, 1984. Ward, Christopher. The War of the Revolution, Vol. 1. New York: Macmillan, 1952.